Thread: DENNIS BYRD.... a JI Salute. 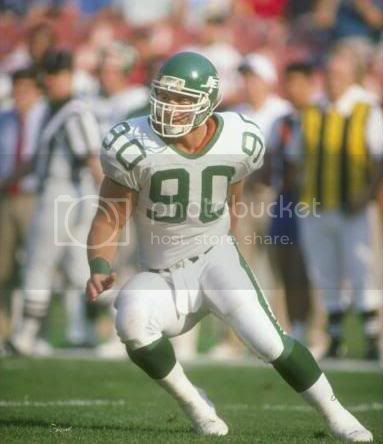 How about a salute to Dennis Byrd. I remember that day like yesterday. Watching the game in LI home, just stunning how quickly it happens. Who remembers that November game? I remember it well. They even made a movie about Dennis Byrd. The week after his injury, the Jets were huge double digit underdogs against the Bills and with inspiration from Byrd, they won the game with Browning Nagle at Quarterback. I remember the game, i was actually on the other side of the border up north (Toronto) at the time of the game. Hard to believe it was 20 years ago. Seems like yesterday. Amazing story. Good luck to you and your family Dennis. Remember that game well. I came home for the weekend from college for my cousin's wedding. That hit was right in front of us. Cant believe that was 20 years ago, damn I m getting old. I remember it well. I remember the anticlimactic feeling everyone had once he left the field. As with other traumatic neck injuries that occur during games, I'm sure we all question why the game should continue. I remember this as well ... Was studying for my college mid terms .... Was first time seeing a career ending injury live as I recall. Too young to remember, but what an inspiring story. I was at that game and remember the silence in the stadium being deafening after he got hurt. Aside from the human tragedy it was a terrible loss for the Jets as Dennis was just finding his stride and was becoming one of the most exciting young defensive players in the league let alone on the Jets. His recovery story is amazing, thank God the Jets doctors and trainers were so on top of medical advancements at the time which no doubt helped save his life and his future. Like lots of us, I was watching the game. I really thought he might not make it. His recovery is nothing short of miraculous and inspiring. Wish I had 1/100th of Byrd's courage, strength, and perseverance. You could hear a pin drop. Definitely a game I will never forget. Everytime we honor a former Jet this season... 49ers... Dolphins... maybe we shouldn't do this on a gameday.